The 9th annual SCoTENS conference took place in the Radisson Blu Farnham Estate Hotel in Cavan on Thursday 29-Friday 30 September, with the title ‘Promoting Literacy and Numeracy through Teacher Education’. The speakers included Professor Terezinha Nunes, Professor of Educational Studies at University of Oxford; Sir Bob Salisbury, Chair of the Northern Ireland Literacy and Numeracy Task Force; and Mr Harold Hislop, Chief Inspector at the Irish Department of Education and Skills. The conference also saw the launch of three North-South SCoTENS reports on Teacher Education for Inclusion, Primary School Teachers’ experience of Healthy Eating within the Curriculum, and Disablist Bullying: An investigation of student teachers’ knowledge and confidence. Ofical Opening by Irish Minister of State for Training and Skills, Mr Ciaran Cannon TD, and NI Minister for Education, Mr John O’Dowd MLA. Dr Harold Hislop, Chief Inspector, Department of Education and Skills, Dublin, and Sir Bob Salisbury, Chair, Northern Ireland Literacy and Numeracy Task Force: The North/South Task Force on literacy and Numeracy. 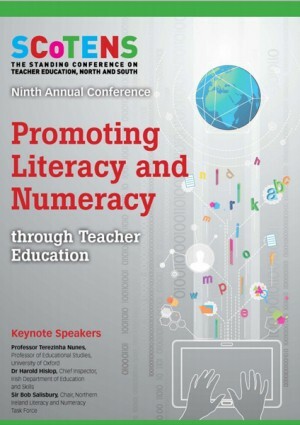 Professor Jackie Marsh, Professor of Education, University of Sheffield and Professor John O’Donoghue, University of Limerick: Literacy and Numberacy – Beyond Definitions? Facilitated by Dr Eithne Kennedy, St Patrick’s College, Drumcondra and Ms Deirdre Robson, St Mary’s University College, Belfast. This workshop will present the Leonardo Effect as an interdisciplinary methodology that facilitates the development of literacy skills among young children through first-hand experiences. Facilitated by Dr Sean Delaney, Marino Institute of Education, Dublin. This workshop will draw on teacher education experience and research into teachers’ mathematical knowledge to identify challenges in designing the content, pedagogy and assessment of mathematics in pre-service teacher education programmes. This workshop will use data showing systemic changes in literacy education in schools, as well as research conducted with student teachers, teachers and parents, to look at current classroom literacy practice in rapidly-changing contexts in both Irish jurisdictions ( and particularly for disadvantaged children). Facilitated by Dr Aisling Leavy, Mary Immaculte college Limerick and Mr Jim Mullan, Queen’s University Belfast. This workshop will explore north/South perspectives on numeracy issues such as: What is the extent of the numeracy problem? Should teachers of all subjects be responsible for addressing numeracy? How cam teacher educators prepare teachers to integrate and promote numeracy? Disablist Bullying: An investigation of student teachers’ knowledge and confidence, launched by Professor Marie Parker Jenkins, University of Limerick. Dinner in Redwood Suite Reception Area. After Dinner speaker: Mr Eddie McArdle, Registrar, General Teaching Council for Northern Ireland. Professor Terezinha Nunes, Professor of Educational Studies, University of Oxford: Why teachers must know about more than phonics to teach English literacy. Achieving Belfast: Mr Paul Lawther, Assistant Senior Education Officer, Western Education and Library Board. Japanese Researh Lesson Study – Loreto Convent, Cavan and St Louise’s Comprehensive, Belfast: Professor John Gardner, Queen’s University Belfast and Dr Mary Magee, St Angela’s College, Sligo. New resources for Special Educational Needs on the SCoTENS website: Dr Noel Purdy, Stranmillis University, Queens. Closing panel discussions: Professor Terezinha Nunes, Sir Bob Salisbury and Professor Jackie Marsh with contributions from delegates.